Helen Garner tells the story of a man and his broken life. She presents the theatre of the courtroom with its actors and audience, all gathered for the purpose of bearing witness to the truth, players in the extraordinary and unpredictable drama of the quest for justice. I have to admit that Helen Garner is one of my favourite Australian writers. I find it quite daunting to completely explain my attraction to her writing. Maybe it’s that she’s a woman around my age. Maybe it’s that she investigates the layers of meaning in her characters. Maybe it’s that she employs a certain pared back journalistic clarity in her writing. I’m not sure it’s any one thing; what I do know is that she brings all that, including her varied experience, to the writing of this book. This is the story of the Farquaharson trial of the father who drown his three small children by driving his car into a dam just outside of Winchelsea near Geelong. Garner was described as ‘a great stylist’ by Jennifer Byrne in a recent interview. Garner responded with a tiny smile. Was that little smile in shy acknowledgement, or in wry acceptance, of being classified as a certain type of writer? I’m intrigued by the term ‘stylist’. I’ve had to go back to my university textbooks on writing, since modern definitions haven’t satisfied me. I think the best definition that captures Garner’s ‘stylism’ comes from the book, Using Rhetoric…”if we succeed in being ourselves on paper, we have achieved that magical something called ‘style’….” And that’s exactly what Garner brings to the page—her self. And that’s perhaps, ultimately, why I so enjoy her writing. 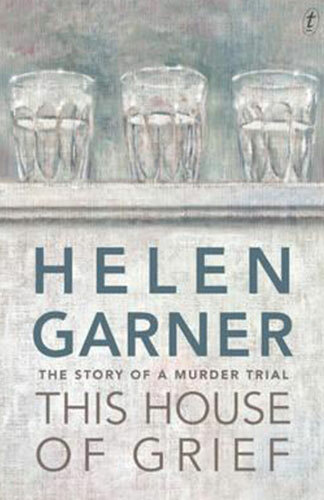 Garner didn’t initially decide to write a book about this trial. She was asked to write about Farquaharson’s committal for The Monthly Magazine. She felt there was more ‘to say’, so thought she’d continue the story with further writing. Being a girl raised in Geelong, the region has significance to her. She was interested in the mother’s (Cindy Gambino) support of her ex-husband’s claim of having a coughing fit and blacking out. What was the motivation there—truth, or disbelief caused by grief at the notion a father could do this to his children? And was this very ordinary sort of man really intentionally responsible for this horrendous act? Unable to access interviews with the families for a book, Garner was forced to devise a different means to tell the story. So she tells you through attending the court room, with all its associated emotional underlay. And it’s here Garner shines. The reader sees the case through the eyes of an observer. Someone who interprets the body language, and gleans the psychological nuances of voice and gesture, and the court room ‘vibes’. Garner reads everyone—jury, counsellors on both sides, witnesses, family, and the accused. This isn’t a book that just presents the facts and asks for a guilty plea. As her intelligent young gap year companion concedes, after talking with friends who ask, ‘Is he guilty?’, ‘That’s the least interesting question they could ask!’ Garner gently weaves her life into the mix as well, getting coffee at the truck near the courts, going to Pilates class, having a drink at her local, talking to her green grocer, being with her grandchildren. She shares with you her thoughts and feelings during those personal interludes. If you can bear to revisit this tragic story, of how an ordinary seeming person becomes one who ‘…formed a dark contemplation…’, then be prepared to think, read, and be touched by Garner’s book of humanity and compassion.